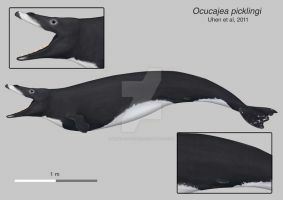 Diagram of Ferecetotherium kellogi, the oldest known sperm whale, its remains were found in Azerbaijan dating back to the late Oligocene (23mya), probably fed on fish rather squid like modern Sperm Whale. Speculative silhouette inferred based on other fossil relatives. -O. Lambert. 2008. 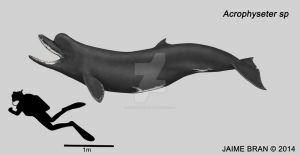 Sperm whales from the Miocene of the North Sea: a re-appraisal. Bulletin del'Institut Royal des Sciences Naturelles de Belgique, Sciences de la Terre 78:277-316 [M. Uhen/M. Uhen/M. Uhen]. 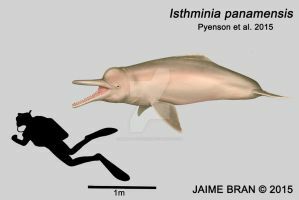 Well fossil suggest that, as far l know physeteroids with and extended forehead are: Physeter itself, Livyatan, and the poorly known Idiophyseter. most of fossil physeteroids lack a concave rostrum although some are not entirely convinced of the Zygophyseter-like forehead. 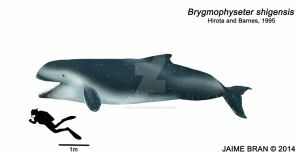 Would Brygmophyseter have had the Zygophyseter-like forehead as well? Probably, is a sister taxon to Zygophyseter. Okay, thanks! I'm drawing one now so I was wondering about that . "Idiophyseter"...sounds like...an unfortunate name lol, but seriously physeteroids are getting weirder by the minute now...at least kogiids don't show changes like that, or do they? Los dientes posteriores son muy curiosos... ¿que funcionalidad tenían?